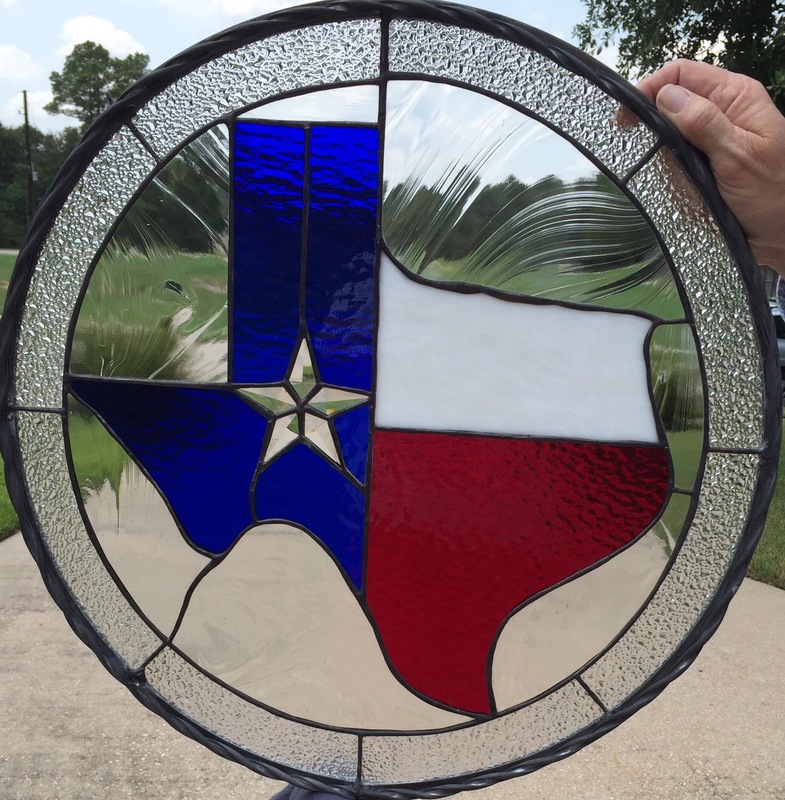 Texas Star Stained Glass. Made with red and blue hammered glass with bevel star and clear baroque background. Has twisted lead around the zinc frame! Measures approximately 20-3/4″ diameter. This one sales for $245.00. For more information call (713) 899-0933! 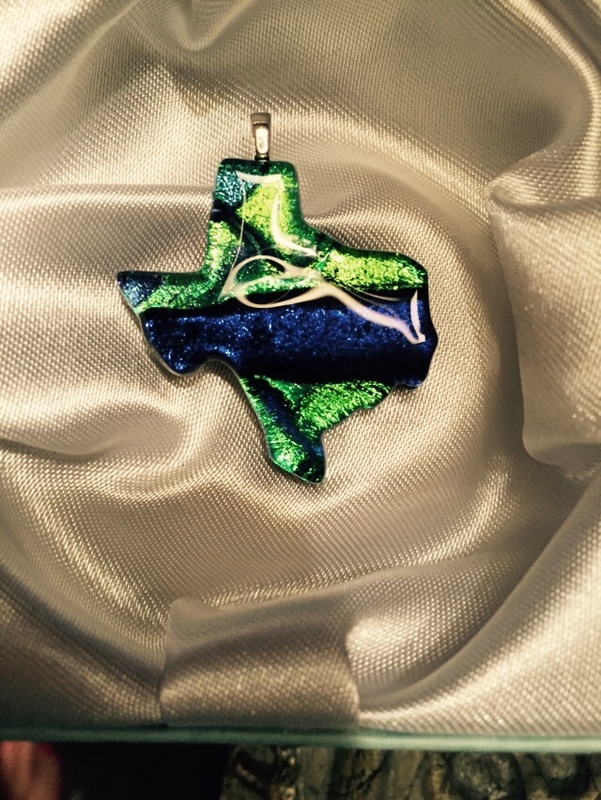 Beautiful dichroic glass Texas pendant! Measures approximately 1-1/2″ and colors will vary. Great gift item! Limited quantity so order yours today. Comes in a beautiful colored box satin lined! For more information please call (713) 899-0933!! Texas Flag. 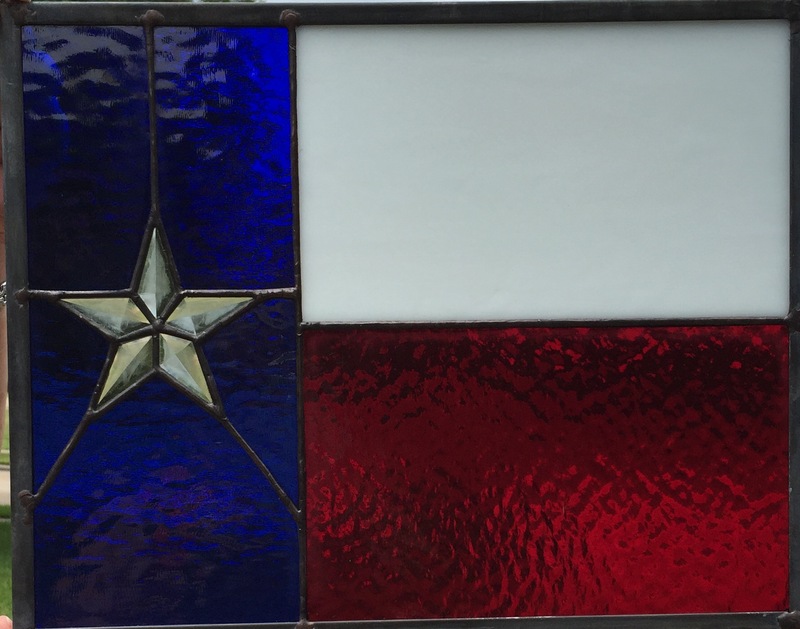 Stained glass flag made with hammered red and blue glass, white glass and a beveled star. Measures approximately 11-1/2 x 14-1/2. For more information please call me at (713) 899-0933!! 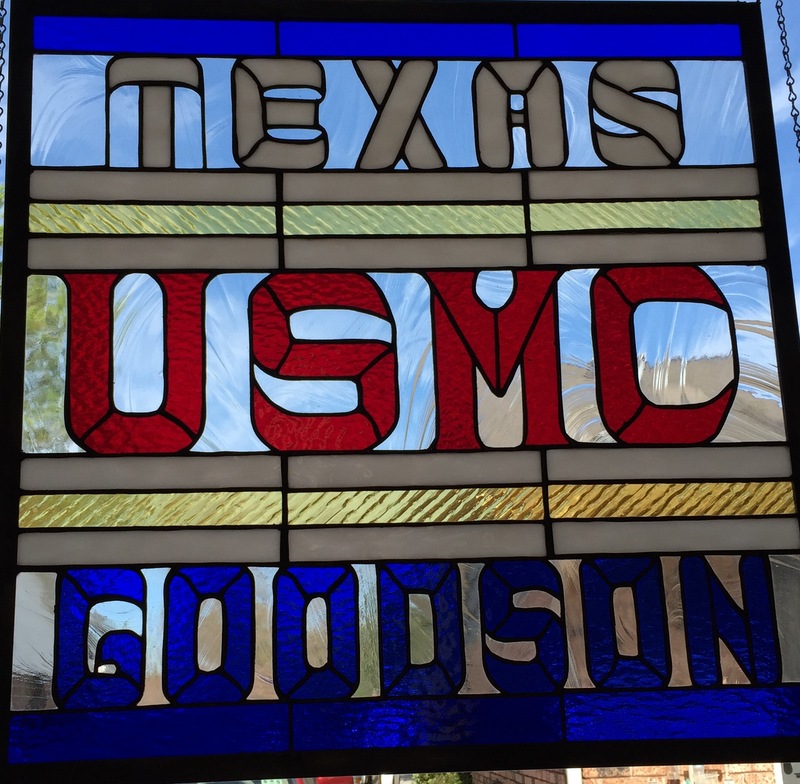 Beautiful Personalized USMC Stained Glass! Made with vivid red and blue hammered, white water glass, gold rope and clear baroque glass! This piece is approximately 24″ x 24″. Going to a very special Marine in California! Just goes to show that anything can be made out of glass! For more information please call (713) 899-0933!! 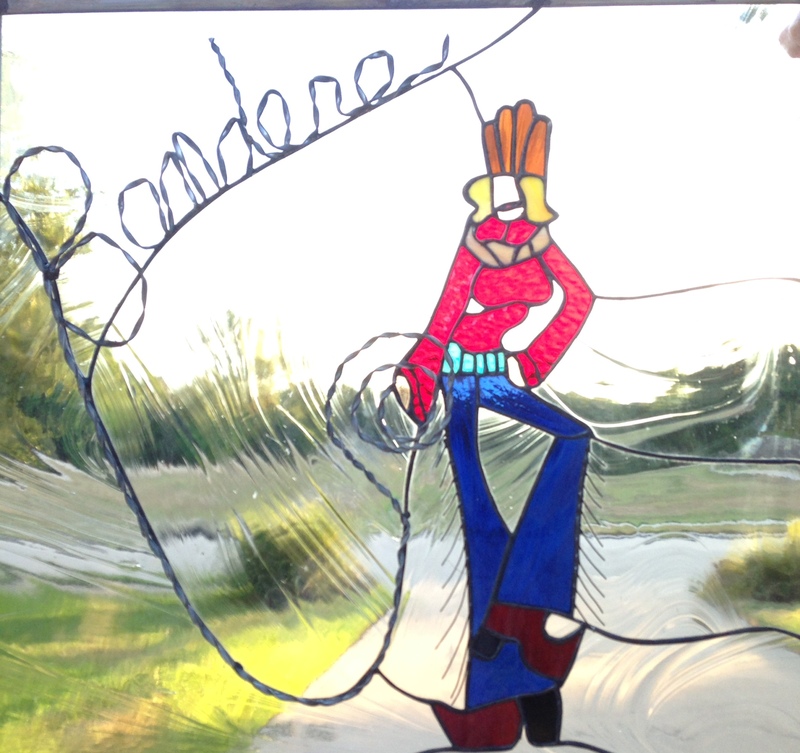 A Cowgirl residing in Bandera, Texas. This piece is going in a door in Bandera, Texas in a Bread and Breakfast. It measures approximately 29 x 29 inches. A beautiful baroque clear as the background with vivid reds, blues, etc. with twisted lead as the lasso and wire for the fringe. For more information on this piece and more call (713) 899-0933. 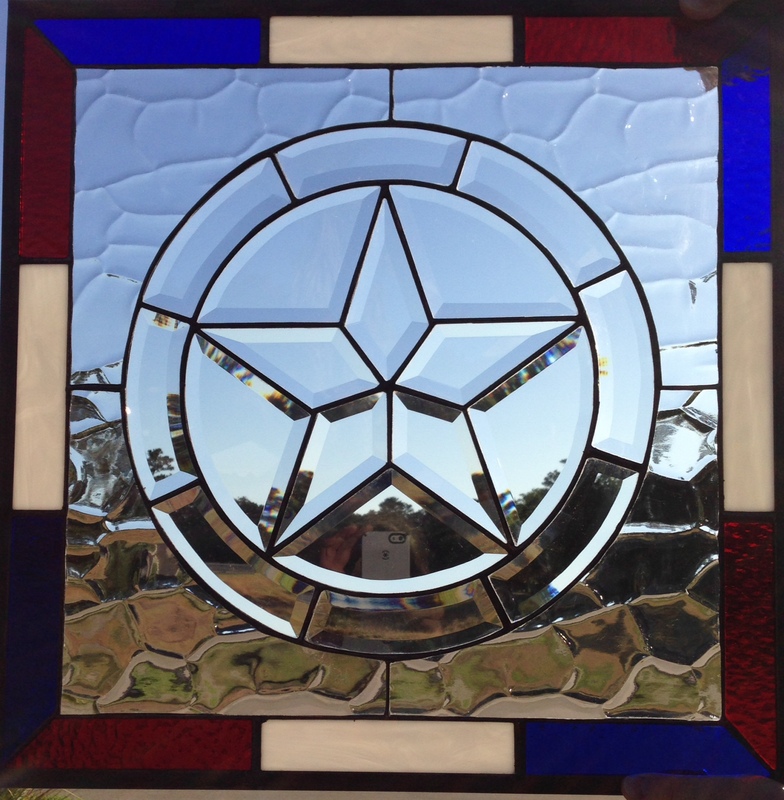 Beautiful Beveled Texas Star stained glass. Made with beautiful giraffe glass background with a red, white and blue border. Measures approximately 20-1/2 x 20-1/2 inches. For more information please call me at (713) 899-0933.